No more standing long hours in the mud – easily take your seat with you! 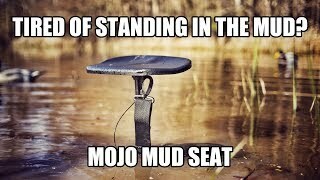 MOJO® set out to design the most comfortable, most stable and most user-friendly seat available to hunters and people of the outdoors – from which came the MOJO® MUD SEAT. It is constructed of rugged steel shaft and supports, and is adjustable for seat height and length of insertion into the mud. 3 steel lateral supports are specially shaped and pinned to the shaft so – as to spread when inserted in the mud to provide stability in all directions. Features a metal seat and a shoulder strap for ease of carrying to your hunting site.